Livonia Fire Station No.3 – Sidock Group Inc.
New Satellite Fire Station adjacent to a large Community athletic complex. 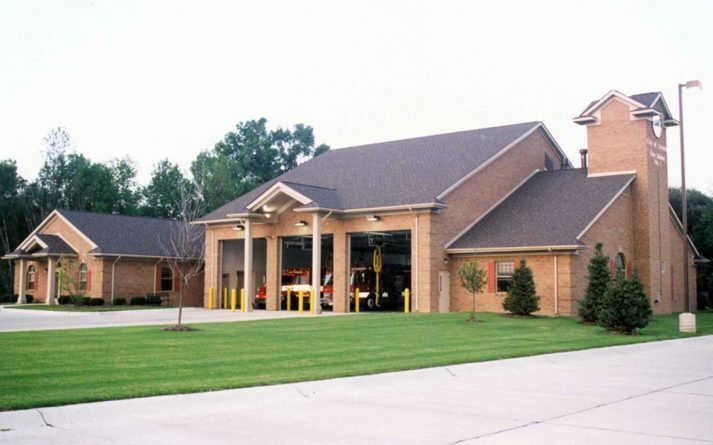 The Station provides three double length drive-thru bays with EMS secure storage, decontamination wash down area, work room, storage, and confined space training ares in the hose tower. Interior spaces include watch room, day room, kitchen, locker/shower rooms, sleeping quarters, fitness room, and quiet study room. Also included in the project was a free-standing comfort station/maintenance garage building serving the athletic complex. The Station was tied into the Citywide energy management system control system.